Adding disks to a SAN can be a long process. In this case we added 12x 600GB SAS drives to a Dell PowerVault SAN. The SAN was configured with 3x RAID groups (RAID10, RAID1 and RAID5) which are split into 2 virtual disks per group. If your SAN has hot swappable drives, you install the drives while the SAN is on. Go to the Logical tab. Right click on the RAID group and select ‘Add free capacity (Physical disks)’. 5. Select which disks you would like to add to the pool. 6. You will notice that it adds the new disks as free capacity to the pool. Note that this process can take very long – In this case 1 hour per 100GB. So it took 12 hours to add 2x 600GB to the pool. You can monitor the progress on the summary tab, ‘Operations in progress’. 7. After the process of adding the disks to the group is complete you need to add the available free space to the virtual disk within the group. This process can also take very long depending on if it needs to move other virtual disks on the SAN to be able to add the necessary space. The one virtual disk that I increased took 40 minutes for adding 300GB, the other took almost 6 hours as it had to move another virtual disk in order to be expanded. 8. Once you have added free space to a virtual disk, you can log into the OS that use the virtual disk and extend the windows volume. 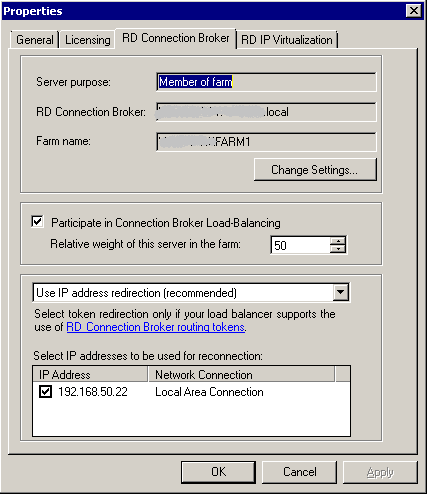 To resolve this – Log into RDS Host Configuration, open RD Connection Broker settings and ensure that ‘Participate in Connection Broker Load-Balancing’ in selected. Getting a JRNL_WRAP error in your event logs is never a pretty site. Losing all you policies and scripts that was in your sysvol folder after fixing the JRNL_WRAP is even worst. This happens when you do the below fixes in an environment where you have only one DC. If you have more than one DC you don’t need to worry as the server that you are applying the fix to will pull the sysvol data from one of the other DC’s. Ok, so there are two ways of fixing a JRNL_ WRAP error in Server 2008 (Remember to make a system state backup before you do this). Follow the instructions that is described in the Server 2008 event viewer – This does an auto restore. Unfortunately this process does not always work, we have had it a couple of times where we sit and wait for this auto restore process to finish but it never happens. a. 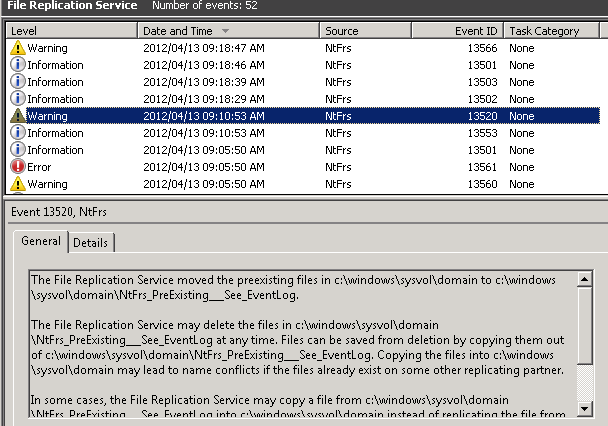 In Command prompt, type ‘net stop ntfrs’. b. Open the registry (Click start, In the Run box, type regedit and press ENTER). d. In the right pane, double-click BurFlags. e. In the Edit DWORD Value dialog box, type D2 and then click OK (This does a nonauthoritative restore, Use ‘D4’ for an authoritative restore). f. Quit Registry Editor, and then switch to the Command Prompt and type ‘net start ntfrs’..
• The BurFlags registry key returns to 0. • Content in the Sysvol folder are moved to the Pre-existing folder. • FRS database is rebuilt. • The server performs an initial join of the replica set from a partner. • The server performs a full replication of the replica sets. Obviously you would like to make sure that you don’t lose your sysvol data (Policies and scripts) – This happens when you run the above fixes in an environment where you only have one DC. Run a system state backup before you make any changes. As soon as you apply the auto restore fix (Option 1 on the above fixes), you will see that it creates a ‘Ntfrs_PreExisting’ folder in the sysvol folder. All the policies and scripts that you had will be moved into this folder. Make a backup of these files before they are removed by the system (See below screen shot for details). You won’t be able to copy these files out before they are moved to the Ntfrs_PreExisting folder as the system locks them. Once the auto restore process completes – Copy the sysvol files that you backed up to the new sysvol folder that will automatically be shares once the process is complete. Should the auto restore process not work, run the burflags fix (Option 2 above) and copy the sysvol files that you backed up to the new sysvol that will be shared after a successful fix. You will know that the JRNL_WRAP error is fixed if you get the below entry in the event viewer. I came across a problem where I saw that an extra DNS A record kept on being registered in DNS for a new SBS2011 server that I installed. 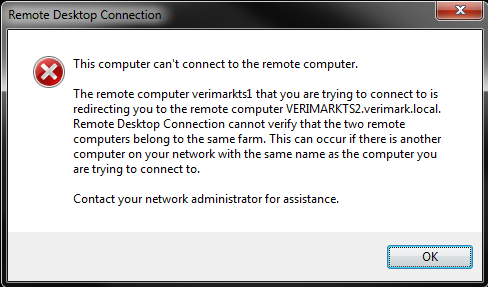 This IP was not assigned to any of my network cards and this entry kept on re-appearing after I deleted it from DNS. After some digging I found that it was the IP that RRAS was assigning to the server (This server is an AD and RRAS server). 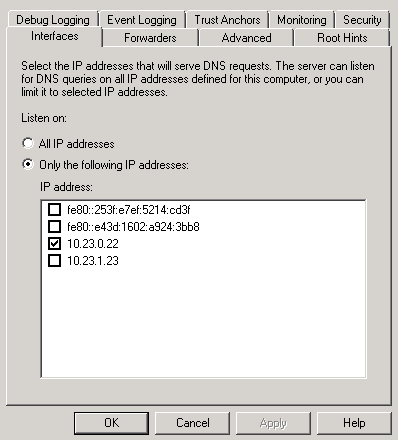 Right click on your DNS server and select properties. Select the Interfaces tab and remove the IP that was assigned to the server by RRAS. 4. Now delete the unwanted DNS entry (Host record) from DNS and this should be resolved.